Team member Katie Saxon did us proud on Monday, by passing her Google AdWords Search Advertising Advanced Exam with flying colours. Katie scored an exceptional 97% to maintain her status as an AdWords Qualified Individual. So, we’ve decided to pick her brains for insider information on AdWords. James: First up Katie, congratulations on your test results, can you tell us what exactly passing this test means? Katie: Cheers. It means I’m now certified by Google as part of their programme to help advertisers find the right Google AdWords Consultant to manage their pay per click accounts. Qualified individuals have to show in depth and up to date knowledge on the latest AdWords best practices by taking a specialist advanced exam every year and a fundamentals exam every two years. James: And are these exams pretty tough? Katie: Well, I think so! You really have to know your stuff to pass the AdWords exams – some of the questions are designed to probe your thinking to make sure you really understand how AdWords works and how to get the most out of it. 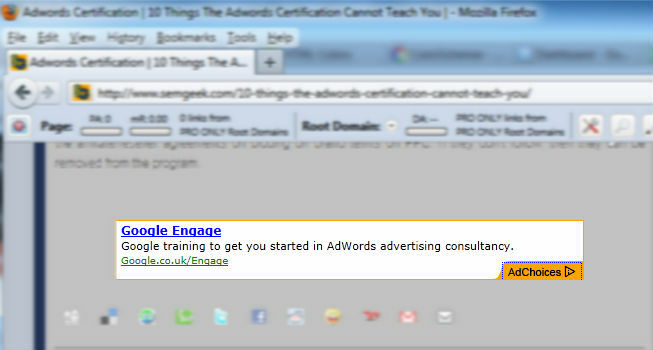 If you aren’t running AdWords accounts on a day to day basis you’d struggle to get the answers right. And with an 80% pass rate for the search exam, you can’t afford to get many questions wrong. James: You mention the pass rate for the search exam, does that mean there are other exams you could take? Katie: Yes, you only have to take one of a possible three advanced exams on different areas of pay per click – search advertising, display advertising or reporting and analysis. Or, if you’re really keen you can take all three specialist exams! I specialise in search advertising, the pay per click adverts you see when you search on Google or one of their partner sites like AOL. It’s the service most of our clients are looking for – because you’re reaching potential customers when they’re actively looking for what you do. James: Can I ask what display advertising is? Katie: Sure, instead of your adverts appearing on search pages, they can appear on any website in the Google Display Network, you may hear it called the GDN. The GDN is a network of thousands of websites that accept adverts. Advertisers can place their ads on specific sites, target key demographics or even advertise to people with specific interests. Unlike search advertising, display advertising gives companies the chance to use images, videos and animations in their ads. James: Sounds like a powerful tool! James: So why specialise in search advertising – is it better than display advertising? Katie: Not necessarily, it depends on what your business needs to get out of its advertising. Many of the businesses that we talk to need to see more conversions: They need to make more money, sell more of their product or service, get more newsletter sign-ups for more effective direct marketing. It’s much easier to get people to do what you want when they’re proactively looking for you than when you’re trying to drag their attention away from something else. That said, if you want to raise the profile of your brand, the Display Network can put your company in front of thousands – if not millions – of people that might like what you do. And Google offers excellent tools that allow you to target people who came to your site but didn’t convert, so display advertising can work on its own – or with search – for great results. James: So, it’s all a question of deciding what your goals are and what you want to achieve before you set out? Katie: Exactly. Without a clear aim in mind it’s hard to develop a coherent strategy that makes the most of your money. James: If you could give advertisers just three tips for putting together an excellent advertising campaign, what would they be? Katie: For search or display? Set SMART PPC goals before you do anything else. In case you haven’t come across it before, SMART stands for Specific, Measurable, Attainable, Realistic and Timely. Basically be clear about exactly what you want to do, when you want to do it by, how you will know when you’ve done it and don’t set impossible targets! Don’t make any assumptions about what will work – online advertising is always a learning curve and what seems like a great idea may fall flat so you’ve got to test everything you do. Get as much research together as you can. Work out exactly who you’re targeting and what they might respond to. And use the data you have like your web tracking programmes to see where you can make improvements. And my bonus tip is that know how much you can afford to spend. If you’ve properly thought about your SMART goals you should have given budget a thought. At the end of the day your success needs to at least in part be measured based on the Return on Investment (ROI) that you see. If an extra £100 of revenue costs you £500 in advertising you’ll go broke fast. James: Great tips, thanks for that Katie! Do you have any questions you’d like to put to our AdWords expert? Comment on this post with your burning queries and pay per click problems and you may see them answered on our blog.